Today's So Shoe Me is the Distilled Sneakers by Penelope Chilvers, $228, available at Anthropologie. The next essential for your spring wardrobe is a signature slip-on sneaker with designer details like luxe leather and a modern print. The cool cobalt blue print adds a luxe liquid look to these 90s shaped slip-ons. Modern and marbled these leather and rubber flats are the perfect everyday shoe with a punch of saturated color. Pair these patterned sneakers with a crop graphic tee and tie dye velvet shorts for a comfortably cool festival look this summer. 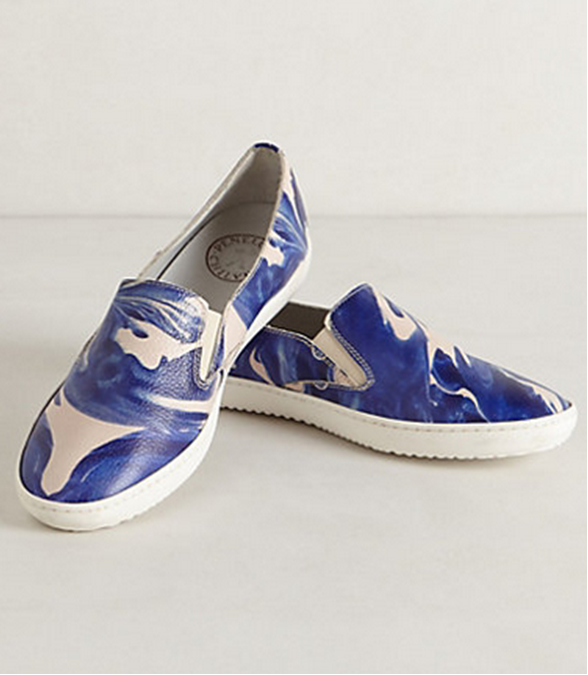 So Shoe Me a pair of marble print slip-on sneakers that will a bright blue hue to my everyday basics.